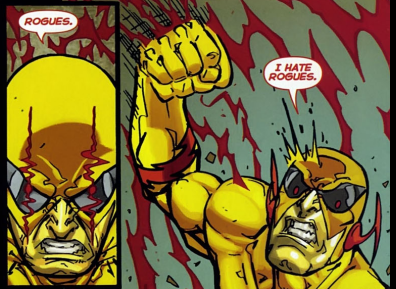 I wish I could find my hardcover Rogues' Revenge collection. Definitely not the deepest comic on the shelves (I hesitate to even call it a "graphic novel"), but it's just so much fun to look at. I don't have much else to share this afternoon. It's my birthday and I'm treating myself to a nap. I've added nine new commentary blurbs to the 8EB archives (starting with page #75), if anyone cares to look. I always find it kind of strange when characters talk during fight scenes in comics. Sometimes I can't help saying the dialogue out loud and thinking "Wow that took a long time. Shouldn't he be fried now?" Then again my dive into comics began with Chris Claremont's run on X-Men so it was kind of hard to ignore. Adam: Writers were doin' that WAY before comic books. Ever read the Iliad? The Min: Thanks a lot, ya ratfink. Aw, sweet talking me I see.